POST a QUESTION or READ FAQs about the history & asbestos or other contents of floor tiles. Asphalt Floor Tiles, Asphalt-Asbestos Flooring, Vinyl-Asbestos Flooring, Linoleum, Ceramic & Cork floors, Painted Floor Canvas, Floor Tiles. This document describes the history of resilient floor tiles and sheet flooring, including the production and ingredients in asphalt-based floor tiles and vinyl-asbestos floor tiles. We list companies producing floor coverings along with historic dates and types of products manufactured. What is the history and age of asphalt flooring? What is the history and age of vinyl-asbestos flooring? How were asphalt floor tiles made? History of asphalt-asbestos floor tile production & history of vinyl-asbestos floor tile production & Photographs of types of floor tiles & floor tile production machines; List of companies that produced asbestos-containing flooring products. This article explains the origins, history, production, and ingredients of asphalt-based and vinyl-asbestos based resilient flooring. In the U.S. federal regulations addressing the management of asbestos-containing materials (ACM) are issued by two agencies: the US Environmental Protection Agency (EPA) rules for the handling and disposal of ACM. Occupational Safety and Health Administration (OSHA) provides regulations specifying practices for worker protection. Our photo at page top (Rosato) shows the "caramel-like" asphalt-asbestos flooring mixture coming out of the rolling machine. At the end of this article you will find a list of guides to identify different types of floor coverings, sheet flooring, linoleum, Armstrong flooring, Congoleum rugs, sheet flooring, tiles, and other floor tiles that may contain asbestos. Major resilient flooring manufacturers or retailers whose products are believed or known to have included asphalt-asbestos or vinyl-asbestos flooring included the floor covering producers discussed below. In 1920 asphalt roofing manufacturers, who had been using asphalt and fiber binders to make asphalt roofing shingles for some time, tried to develop a rigid product that could be a substitute for (more costly) slate roofing. The material did not perform acceptably as a roof covering, but it led to the development of asphalt floor tiles. Asphalt floor tiles are 9" square (or other sized) tiles which used asphalt as the main binding material. the original asphalt tiles were produced only in dark colors because asphalt was a main ingredient. Rosato (ASBESTOS TILE MANUFACTURE) indicates that the first publicized asphalt tile installation was in 1920 in New York City's Western Union office. The product was very successful and by 1936 over four million square yards of asphalt floor tiles were being sold annually. By 1940, 5% of floor coverings sold in the U.S. were asphalt tile. -- Rosato. Our photo (above left) also from Rosato, shows an Armstrong asphalt floor tile installation. In the U.S. the 1940's saw a tremendous expansion in the sales of this flooring material, largely because other materials were more difficult to obtain. At the end of World War II and combined with the reduction in military consumption of the product, asphalt floor tile sales increased to about 12% of the flooring market (1946), selling 41 million square yards. This photograph of sheet flooring was identified by a reader in a 1964 home. She found remnants in the bottom of a kitchen cabinet on which was imprinted "Armstrong". While the reader referred to this as "Armstrong Congoleum sheet flooring", Armstrong and Congoleum are separate individual companies. The sheet flooring shown at left is identified as an Armstrong resilient flooring product. As we detail at our FAQs section at the bottom of this page, another reader had a sample of this resilient flooring tested and confirmed a 70% asbestos content. Amitco International, another larger producer of floor tiles has operated from 1964 to the present. Amico flooring is discussed and illustrated in more detail at AMITCO ASBESTOS FLOOR TILES. Armstrong Flooring: In the U.S. Thomas Armstrong, a Scotch-Irish immigrant, began his business as a cork cutter in 1860, delivering hand-carved bottle corks by wheelbarrow. The use of cork expanded to the construction of corkboards (bulletin boards) and cork-insulated brick. By 1909 Armstrong had begun producing linoleum. "Corkboard led to fiberboard, fiberboard led to ceiling board, cork floor tile led to linoleum that ultimately led to vinyl floor coverings, in both tile and sheet vinyl forms. Armstrong's familiarity with cork grew into today's Armstrong Corporation worldwide as one of the largest flooring producers. " - Armstrong. One of the most significant flooring producers in the U.S. has been Armstrong World Industries (Lancaster PA), founded in 1860 by Thomas Armstrong. In its original business, Armstrong was at one time the largest cork supplier (their first product: cork stoppers), produced corkboard and brick. By 1906 Armstrong began producing linoleum, later vinyl flooring and many other flooring products. Asbestos litigation [appears to have] led to a bankruptcy filing in 2000, from which the company emerged to continue as a successful flooring producer. The Armstrong Flooring company continues today as one of the largest floor covering producers in the world, with plants in Canada, England, France, Germany, Switzerland, Sweden, Belgium, Austria, Spain, and China. The company's modern flooring products do not contain asbestos. Modern Armstrong 12"x12" x 1/16" (1.5mm) Self-Adhesive "Stick-on" Floor Tiles do not contain asbestos. As we detail at ASBESTOS FLOOR TILE IDENTIFICATION PHOTOS 1949-1959, depending on the age of manufacture, some resilient flooring products used asbestos as a primary ingredient (well actually at up to about 50% content) typically chrysotile and some amosite asbestos. Also see ASPHALT & VINYL FLOOR TILE HISTORY. Contemporary resilient flooring products such as the vinyl floor tile shown at left do not contain asbestos however. At left is a photo of Armstrong Excelon Vinyl Floor tile, a contemporary, popular resilient floor covering, sold in 70 colors at retail outlets including Home Depot stores, this modern resilient floor tile does not contain asbestos. At FLOOR, RESILIENT VINYL or CORK we discuss the choices, selection and installation details for contemporary vinyl and other resilient flooring products. The 9"x9" square asphalt-impregnated paper-backed floor tiles shown here are discussed in detail at FELT-PAPER-BACKED FLOOR TILES. 1886: Congoleum Nairn was founded by sailmaker Michael Nairn, Kearney New Jersey in 1886 (the same year my grandfather Louis Friedman arrived at Ellis Island from Yoniver, Lithuania), originally produced painted floor-cloth coverings using sailcloth. The company later produced early forms of linoleum backed by fabric including burlap-like fabrics. See examples of CONGOLEUM - NAIRN CORPORATION FLOORING in this web article, with photos from the 1920's to 2003. See an example photo above-left and discussed at the top of our building age determination article: FLOORING MATERIALS, Age, Types - Note that this antique flooring may not be a Congoluem-Nairn product). According to Congoleum-Nairn, Linoleum, the precursor of modern resilient floors, was a hard smooth-surfaced flooring made of solidified linseed oil and ground cork, adhered to a backing of canvas or burlap such as that shown in our example. 1919 Congoleum Art Rugs: According to some sources, by 1919 Congoleum Art Rugs were in popular demand but the company's website history indicates that it was in the 1920's that Nairn joined with Congoleum (whose asphalt-based raw materials originated in the Belgian Congo) in the 1920's to produce Congoleum, a three-foot wide simulated wood grain floor covering product, and to produce linoleum - Congoleum Gold Seal Rugs and Nairn Linoleum into the 1930's. See this 1928 CONGOLEUM RUGS SHEET FLOORING - a Canadian Congoleum art rug installed in a home in Nova Scotia. 1930: asphalt & red-backed Congoleum Gold Seal Rugs and Nairn Linoleum were sold into the 1930's until replaced by vinyl-based products. 1935: Congoleum vinyl flooring research: In the 1930's Congoleum-Nairn was researching vinyl flooring, a product whose use grew rapidly after 1945. I [DF] speculate that while asbestos was in some asphalt-impregnated paper backers on flooring products, asbestos formed a still-higher proportion of light-colored backer found on vinyl flooring products made in the 1950's and later. 1950: Congoleum linoleum sheet flooring: by the 1950s Congoleum-Nairn were producing twelve-foot wide sheet flooring or modern "linoleum" and the company produced the Vinylbest™ vinyl asbestos floor tile series, and by 1955, the Congoleum Gold Seal inlaid linoleum flooring shown at left, Gold Seal Inlaid Linoleum "Fashion Floor" was featured in Life and other magazine advertisements as both sheet flooring and 9" x 9" floor tiles. Watch out: Backing used on some vinyl flooring products may contain asbestos. Other Congoleum products included Vinylfloor, Vinyltop (countertops), Congoleum, CongoWall, Ranchtile, Cork tile, Linoleum tile, Vinyl tile, Rubber tile, and Asphalt tile marketed under the Congoleum Gold Seal trademark. The Congoleum Sequin Pattern sheet linoleum provided a scattershot or color fleck pattern. 1993: Congoleum-Amitco venture: In 1993 Congoleum-Nairn formed a joint venture with Amtico Floors, also a manufacturer of resilient floor tiles. 2003: Congoleum bankruptcy: in response to liability from asbestos hazard or injury claims, Congoleum Nairn filed for bankruptcy under Chapter 11 on 31 Decembver 2003. 2010: Congoleum emerges from bankruptcy: the bankruptcy court approved Congoleum's reorganization plan by mid 2010. There you'll read that the principal asbestos exposure from Congoleum products was of people working in construction and remodeling in residential and commercial buildings. 2018: Currently Congoleum continues to produce a wide range of residential and commercial sheet flooring and floor tile products, made in the U.S. at the corporation's factory in Trenton, NJ. Congoleum Nairn flooring and asphalt or vinyl tile flooring photos wanted - CONTACT US. While inspecting this home for a buyer I noticed this box and the tiles on the floor. All over the floor and next to the box are 1 inch holes drilled and filled with tiny plugs. The seller made the plugs to cover termite drill holes from treatment. he had no idea the danger of drilling these tiles and breathing the dust. As you walk across the floor the tiles crack under your feet. The buyer was going to cover the tiles with a carpet and forget about it. My opinion was that that would be dangerous as the tiles are crumbling and the vacuuming of the carpet would sent the asbestos dust all through the house and be worse. further, the central heating ducts may be filled with the dust from past drilling and the home should be properly cleaned. only testing will tell the level of contamination from asbestos. EVER WEAR FLOORING produced vinyl-asbestos floor tiles, as we illustrate at the same Floor Tile Photo ID Guide cited above. Do you have info about whether the following 2 tiles contain asbestos? 1. Box says Color Tile vinyl floor tile 12x12 code 422 80 made by Goodyear Tire & Rubber Co. Plant C Akron, Oh. and sold by color tile supermart with a Vancouver, Wa address. 2. Box says Amtico Suravinyl Tile 12x12 1/16 ga 7LDF18 AH084 1 AL1102 and also says Zip Stik self adhering duravinyl tile; made by American Biltrite INc. Trenton, NJ. My previous email had a typo-- 2. should read Amtico Duravinyl. American Biltrite in Trenton produced asbestos-containing floor tiles; if your American Biltrite flooring was installed before 1980 it's likely that it contains asbestos. Goodyear also produced asbestos-containing floor tiles. I'd make the same suggestion: if your Goodyear flooring was installed before 1980 it's likely that it contains asbestos. Kentile KenFlex Floor Tiles Kentile was founded by Arthur Kennedy in 1898, had its primary location at 58 Second Ave., Brooklyn 15 NY. Kentile produced Kentile (asphalt floor tiles of vinyl-asbestos floor tiles), Kencork (cork floor tiles), and Kenrubber (rubber floor tiles) (at least) as 9" x 9" resilient flooring including patterns and in 23 bold colors (1949) and in 26 colors (1952), many of which are shown in our separate article at KENTILE KENFLEX ASBESTOS FLOOR TILE GUIDE - asbestos may be in Kentile products produced through 1986. In 1949 Kentile was producing asphalt-based floor tiles. In the early 1950's, Kentile produced mostly asphalt-based floor tiles but also some cork-based floor tiles. In 1951 a 8' x 9' room floor cost $10.95 when it was consumer-installed. In 1969 Kentile was producing vinyl sheet flooring. Kentile's sign, along the Gowanus Canal (Brooklyn New York, ca 1949) has been considered an important landmark in its own right. In Canada Kentile flooring was distributed by T. Eaton Co., Ltd. The company filed bankruptcy in 1992, ceasing operations in 1995. American Biltrite in Trenton, NJ produced asbestos-containing floor tiles from 1 January 1961 through December 1985; the company also produced sheet vinyl flooring whose backer contained asbestos fibers, from 1 January 1962 through 1968 and from 1975 - 1980. If your American Biltrite tile flooring was installed before 1986 it's likely that it contains asbestos. If your sheet vinyl flooring from American Biltrite was installed before 1981 it's likely to contain asbestos in its backer. Bonafide Milles, manufacturer of asbestos-containing flooring, merged with American Biltrite in 1961. Matico (Mastic Tile Corporation of America) distributed plastic reinforced asphalt tile. Matico advertised "factory waxed" 9x9 floor tiles (1953) produced in plants in Houston TX, Joliet IL, Long Beach CA, and Newburgh NY. The company also distributed Milmark adhesive for floor tile application. (We believe that both the floor tiles and the mastic contained asbestos). Tile thickness (Lot B405-02259A43) was indicated to be 1/8". The Matico 9x9 floor tile packaging and the floor tile photos below were contributed by reader M.Z. Notice though that the brown and beige floor tiles in the accompanying photos look very much like an asbestos-containing Armstrong Product - see 1957 - Armstrong Excelon Vinyl Asbestos Floor Floor Tiles, Patterns & Color Guide at ASBESTOS FLOOR TILE IDENTIFICATION PHOTOS 1949-1959 where we include similar images of Excelon WOODTONE 9 x 9 x 1/16" & 1/8" Floor Tiles [image file]. In that same article you'll see that by 1973 there were some very similar looking floor tiles made without asbestos. Montgomery Ward vinyl asbestos tile flooring are described at at MONTGOMERY WARD ASBESTOS FLOOR TILE IDENTIFICATION. Excepts are below. and at our ASBESTOS FLOOR TILE IDENTIFICATION PHOTOS 1949-1959. Excepts are below. Below our photographs show the embossed pattern on these Sears vinyl asbestos floor tiles. The tiles are solid through in color and material and are about 1/16" thick and 9" x 9" in size. Below right shows these Sears floor tiles installed. SEARS ROEBUCK VINYL ASBESTOS FLOOR TILE RECOGNITION also sold and sells a variety of other flooring materials including asphalt and vinyl asbestos resilient floor tiles. Watch out: floor tile adhesives or mastics used for bonding floor tiles and sheet flooring to the subfloor also contained asbestos into the 1970's..
"Asphalt" tile refers to flooring that used asphalt as the principal binder. Asphalt -asbestos floor tiles that were manufactured early in the product life (1920's) were either black, near black, brown, or a gray-brown tone. Dark vinyl-asbestos tiles used, for example, a mixture of 40 parts asphalt or gilsonite, 60 parts asbestos floats, 30 parts powdered limestone, and pigments (parts by weight). Another typical mixture cited by Rosato contained 70% asbestos fiber. Originally, asphalt floor tile was produced by mixing heavy asphalt solutions with a high percentage of asbestos fiber, hardening the tile by evaporation of the solvent. This procedure produced very dark floor tiles,. To obtain brown or intermediate colors, Gilsonite was used, dissolved in naphtha. "Modern" asphalt tile (1950 and later) contained little or no asphalt. Rather than using asphalt or gilsonite binders, this later product used synthetic organic resins and additives or plasticizers based on petroleum or vegetable pitches. But asbestos fillers remained the main ingredient in "asphalt" tile. - Rosato. Our photo (left, Rosato) shows the "caramel-like" asphalt-asbestos flooring mixture coming out of the rolling machine [image] as a soft sheet where the operator pulled the material from the machine and sent it to calendar rolls for thinning before it was hardened and cut into squares. This photo shows the calendar rolls used to thin and polish the asphalt-asbestos floor tile during its final manufacturing stage (Johns-Manville Corp. - Rosato). Rosato [reference] cites another flooring material from the 1950's called asbetic flooring which was a mixture of ground mother rock and the shortest, otherwise unusable asbestos fibers. Short asbestos fibers may also be among the more hazardous if airborne. Asbestos was also used in a mixture with waterglass (a clear binder used in many chemical applications and even for cementing stove gaskets) as a hard binding compound. See ASBESTOS FLOOR TILE COMPOSITION where we compare the asbestos content and types of asbestos used in ceiling tiles, spray fire-resistant coatings, and floor tiles. Asbestos-Containing Floor Tiles or Sheet Flooring Contain Lead? Vinyl-based (asbestos-containing) floor tiles became the most important and most widely-produced form of plastic floor tiles after World War II. The product was similar to asphalt-based flooring, but was more flexible. Vinyl-based floor tile could thus be produced more economically and installed more easily as it was thinner, typically 1/16" to 3/32" (residential) and 1/8" thick "gauge" (commercial) versions. Our photo (left) shows the calendar roll processing stage for floor tile (Rosato - Johns-Manville). The use of vinyl as the tile base also permitted a wider range of lighter colors and patterns than was achieved with asphalt-based floor tiles. Vinyl-asbestos tile [was] used above or below grade on smooth wood or concrete base. As it wears it gets smoother and takes waxing very well. Its resistance to scratching or marring and to strong detergents is excellent. The batch type-continuous process type of flooring [was] made by a combination of batch type and continuous process. It consists of vinyl-chloride vinyl-acetate copolymer resin mixed with plasticizers, stabilizers, asbestos, limestone and color pigments. Various types of mixing equipment [were] used to fuse these ingredients into a hot mass of the base, or field color. Then, this base [could] be decorated on a two-roll differential speed mill by adding previously made granules of the proper shapes and colors to produce the desired design. The thick blanket of tile material was cut from the mill, butted to a previous slab, fed into a two-roll calendar to squeeze tile to the required thickness, moving on to a cooling stage and a blanket press where rows of 3 to 5 tiles were cut from the sheet. An entirely different approach to the processing of vinyl resins into flooring materials [was] the use of vinyl plastisols or organosols. These materials are dispersions of vinyl resins in plasticizer (plastisols). These dispersions are of a fluid nature; the methods for their application are based on their flow characteristic, on their ability, when heated to 350 degF to fuse into the same tough resilient vinyl plastic that requires the process described above. Armstrong produced asphalt-based floor tiles, possibly including asbestos in their formulation, before 1952 and in later years as we indicate with examples and photographs in the detailed photo guide that is found below. For more information about these older flooring types, see ASPHALT & VINYL FLOOR TILE HISTORY - history, dates, and description of the production process and ingredients in asphalt floor tiles, asphalt-asbestos floor tiles, & vinyl-asbestos floor tiles 1900 to present. Also don't assume that only "vinyl asbestos floor tiles" include asbestos. According to Rosato, asbestos filler (powder) and fibers were used in asphalt based products too. "The first publicized installation of asphalt tile was in the Western Union office in New York City (1920). By the end of 1930, 3 million square yards of tile was being produced annually. By 1952 "asphalt-asbestos" floor tiles contained much less asphalt or gilsonite. Those binders produced only dark tiles. IN the 1950's manufacturers changed to use of synthetic organic resins and solvents made of vegetable or petroleum pitches. These new synthetic binders permitted manufacture of lighter colored, brighter floor tiles in a wider range of colors. But asbestos continued to be the main filler ingredient in these tiles. Vinyl asbestos floor tiles were produced from approximately 1954 to 1980. Early vinyl asbestos flooring was made in 9" x9" floor tiles, and also sold as decorative or accent solid color strips, typically 1" wide by 24" long. By 1960 12" x 12" vinyl asbestos floor tiles were produced by Armstrong™, particularly their Excelon™ line. Asbestos was also used in sheet flooring. By 1973 only a small portion of flooring was produced as asphalt-based floor tiles (9"x9") as vinyl asbestos flooring was dominating production. The size, thickness, color, and patterns of floor tiles can distinguish between asphalt-asbestos and vinyl-asbestos flooring. While asbestos-containing floor tiles were made in a wide variety of colors and patterns (see ASBESTOS FLOOR TILE PHOTO ID GUIDE), if you encounter black or very dark asphalt floor tiles they are probably particularly high in asbestos fibers. We discuss floor tiles as an asbestos fiber source in buildings in more detail at ASBESTOS FLOORING IDENTIFICATION. Some self-adhesive floor tiles made by Armstrong also contained asbestos. Armstrong introduced peel and stick tiles in late 1969. The company stopped manufacturing these tiles with asbestos in December of 1982. Not all adhesive floor tiles produced during this period contain asbestos. It is necessary to know the flooring product model number or collection name of a tile in question, or to submit a sample to an asbestos test laboratory to make a final determination. - information courtesy of Armstrong Corporation. More about asbestos-containing peel and stick floor tiles can be found at SELF-ADHESIVE PEEL & STICK ON ASBESTOS TILE IDENTIFICATION. Another application of asbestos with vinyl tile involves the use of asphalt saturated asbestos felt applied under 1/8 inch thick tile. This felt underlay provides for smoother finished flooring. It is possible that this development is what led to continuous-sheet asbestos-felt-underlayment backed sheet flooring. But we point out that continuous sheet flooring and asphalt tile flooring has an older history. The original resilient floor covering, linoleum, was used as a floor decking on British naval ships. Asphalt tile was first made as a mastic type of floor covering. The mastic was troweled on as a deck covering over wood. The original mixes included asphaltic binders, with fillers of asbestos; mixing was done on a rubber mill. Asphalt -asbestos tiles manufactured early in their life (1920's) were either black, near black, brown, or a gray-brown tone. Brown asphalt-asbestos tiles were made by substituting gilsonite as a binder. In both cases the tiles were hardened by evaporating a solvent used in the fabrication process, or by cooling of hot asphalt used in the mixture. Gilsonite could be used to produce a wider range of mixtures, but required some asphalt as a softener. Dark vinyl-asbestos tiles used, for example, a mixture of 40 parts asphalt or gilsonite, 60 parts asbestos floats, 30 parts powdered limestone, and pigments (parts by weight). Another typical mixture cited by Rosato contained 70% asbestos fiber. Asphalt asbestos floor tiles were popular in the U.S. from 1920 into the 1960's. Asphalt-asbestos floor tiles were produced at first in dark colors using a heavy asphalt binder combined with a very high percentage of asbestos filler fibers. It would be uncommon to find these floors still in use today, but if you encounter black or very dark asphalt floor tiles they are probably very high in asbestos fibers. Asphalt-asbestos floor tiles were produced at first in dark colors using a heavy asphalt binder combined with a very high percentage of asbestos filler fibers. It would be uncommon to find these floors still in use today, but if you encounter black or very dark asphalt floor tiles they are probably very high in asbestos fibers. As we introduced above, the earliest use of asphalt-based flooring reported by Rosato was as a troweled-on mastic applied as a deck covering for ships in the U.S. Navy in 1917. Older nine-inch "thicker" vinyl or asphalt-based floor tiles, many more recent 12-inch floor tiles (1960 - 1980), and some more recent sheet linoleum as well as the mastic used to bed or glue down older flooring materials are likely to contain asbestos fibers and should not be disturbed by grinding, sanding, or demolition without taking the appropriate precautions. We discuss the inspection, diagnosis, and repair of various flooring products at FLOOR TYPES & DEFECTS. The Wards vinyl asbestos floor tiles shown just below are nominally 1/16 gauge (4mm) in thickness 9" x 9" square. Armstrong vinyl asbestos 9" x 9" floor tiles may also have been produced in three thicknesses, depending on the cost and durability desired by the consumer: 1/16", 3/32", and 1/8" thickness. Our 9" x9" lab sample of Armstrong vinyl asbestos floor tile was measured at 3/32" (about 2mm) thick. The 1/8" thick floor tiles were considered commercial or heavy-duty grade. Armstrong also made 12" x 12" vinyl asbestos floor tiles beginning in 1960. By 1972 most Armstrong vinyl asbestos floor tiles were sold in the 12" x 12" dimension. From 1973 to 1980 all Armstrong Excelon vinyl asbestos floor tiles were sold in 12" x 12" size. At left is our photo of an asbestos-containing floor tile sold by Montgomery Wards®. In additional photographs below we show the examination of this "asbestos floor tile in the lab" as well as photos of the original labeling on the package in which these tiles were distributed. We discuss the history of vinyl-asbestos floor tiles in our Age of House articles at FLOORING MATERIALS. We discuss the inspection and diagnosis of various flooring defects, including vinyl asbestos tiles, at FLOOR TYPES & DEFECTS. According to Rosato, even when vinyl or other synthetic organic resins were used as the binder to produce light colored floor tiles, asbestos fibers continued to be the main ingredient in these floor tile products, and may be present at levels as much as 70% by weight. Shown at left is a vinyl-asbestos floor specification summary and usage guide from 1959 - Armstrong. Here is the information from the original package in which this Montgomery Wards asbestos-containing floor tile was sold. 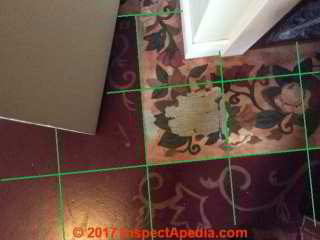 See MONTGOMERY WARD ASBESTOS FLOOR TILE IDENTIFICATION for details. At the time of its popularity, the addition of asbestos fibers to the binder making up these floor tiles was considered a benefit in fire resistance and durability. Click on any of these images to enlarge them to read the packaging text. The resilient sheet flooring shown at left is a modern product (we are using this photo as a placeholder) and does not contain asbestos. During demolition or removal, this material should be disturbed as little as possible. Additional demolition, renovation, and installation advice for dealing with resilient sheet flooring materials can be obtained from the Resilient Floor Covering Institute, by obtaining their publication on the topic. This sheet flooring covering backed with burlap fabric is probably more than a century old. We examined it in an non-public area of the Justin Morrill Homestead, a historic building in Vermont. The material has not been tested for asbestos fibers. But the backing material appears by visual inspection to be jute or "burlap". This Armstrong flooring tile is 12" x 12" x 1/16" or 1.5mm thick. Unlike the older vinyl-asbestos floor tiles whose photographs we provide below, this more recent flooring product is built from a thin vinyl layer containing the tile's design pattern and a fiber/paper backer (shown in our photo above) to which an adhesive was coated so that the tile could be installed without use of a mastic. A typical pattern is the embossed design shown at left. The floor tile thickness (about 1.5mm or 1/16") suggests that this product was produced after 1980 and probably does not contain asbestos. Below we show a photo of the Armstrong© Stamp found on the under-side or "back" of 12 x 12 "stick-on" self-adhesive floor tiles produced by Armstrong. Depending on the age of manufacture, some paper-backed flooring products used asbestos as a primary ingredient (see ASPHALT & VINYL FLOOR TILE HISTORY). Tests of our example floor sample (above) for asbestos confirmed that some early peel-and-stick floor tiles sold in the 1980's did contain asbestos. Contemporary resilient flooring products do not contain asbestos however. Shown at left: Armstrong Excelon Vinyl Floor tile, contemporary, popular, sold in 70 colors at retail outlets including Home Depot stores, this modern resilient floor tile does not contain asbestos. [Click any image to see an enlarged, detailed version]. A catalog of floor tile identification photographs for products that contained asbestos, 1952 - 1980, is provided below at ARMSTRONG VINYL-ASBESTOS FLOOR TILE PHOTO ID CATALOG - 1952 - 1986..
And at ARMSTRONG FLOORING HISTORY we provide a history of Armstrong flooring and links to company information. Contact Us to send a photograph of your own floor tile pattern or for assistance in identification if you can't find your floor tile image, pattern, or design in this floor tile color and pattern library. See FLOOR TILE / SHEET FLOORING PHOTO GUIDES - list of photo guides. Examples of floor tile packaging, labeling, and other information can be found throughout the flooring photo collections listed here. ASBESTOS FLOOR TILE COMPOSITION - comparing the most-common forms of asbestos found in ceiling tiles, fire-resistant sprays, and floor tiles. ASBESTOS TILE MANUFACTURE - details how asphalt asbestos floor tiles and vinyl asbesos floor tiles were manufactured, their ingredients & composition including production quantites, asbestos content, other ingredients. FLOOR TILE HISTORY & INGREDIENTS - history, dates, and description asphalt floor tiles, asphalt-asbestos floor tiles, & vinyl-asbestos floor tiles 1900 to present. FLOORING MATERIALS, Age, Types - Age of Building Flooring Materials - A Guide to Estimating Building Age, This article describes types and ingredients in flooring materials: Asphalt floor tile, Cork floor tile or planks, Laminate flooring (modern), Linoleum & older sheet flooring (painted canvas), Vinyl-asbestos floor tiles, Wood flooring. FLOOR TYPES & DEFECTS - Asphalt floor tiles, asphalt-saturated asbestos felt, carpeting, cork floor tiles & planks, laminate flooring (modern), linoleum (sheet flooring) & earlier painted fabric floor coverings, vinyl-asbestos tile floors, wood flooring. ASBESTOS FLOOR TILE LAB PROCEDURES - photos of how vinyl asbestos flooring is analyzed in the lab. "Resilient flooring" is defined as materials softer than the non-resilient flooring materials such as stone, slate, brick, ceramic tile that we list just below.. Resilient flooring materials include organic types of flooring: asphalt based floor tiles, rubber floor tiles, vinyl-asbestos floor tiles, linoleum, and plastic tile. So what's "wood flooring" ? Non-resilient, resilient, or just "wood"? Wood. Definition of non-resilient flooring: Ceramic tile, stone tile, slate or brick. "Non-resilient" flooring is defined as hard surfaced flooring material such as stone, brick, slate, or ceramic tile. See FLOOR, CERAMIC TILE). Continue reading at ASBESTOS TILE MANUFACTURE or select a topic from closely-related articles below, or see our complete INDEX to RELATED ARTICLES below. Or see FLOOR TILE HISTORY & INGREDIENTS FAQs - question & answers posted originally at this page. 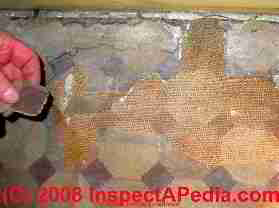 FLOOR TILE HISTORY & INGREDIENTS at InspectApedia.com - online encyclopedia of building & environmental inspection, testing, diagnosis, repair, & problem prevention advice.